﻿Rob has finally gone. Good luck him and I hope he does well. 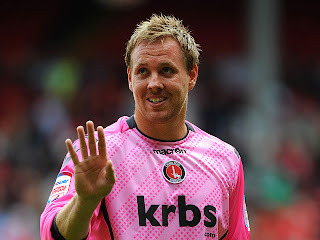 Being a Charlton fan and home produced he had a great rapport with the fans. He always had time for them too. He is still young for a keeper and this season in particular he has shown he has some potential. A 5 year deal gives him some security. I wish him all the best. ﻿In what may be a long day in respect of transfers we will see where Benson ends up with Bradford looking most likely at the moment. We may also see Francis depart with Bournemouth looking favourites for his signature. We hope to see a striker come in with several names in the frame. As Dave from Drinking During The Game said yesterday it'd be good if we could get a surplus to requirements premiership striker on loan. I'd be more than happy to see Eccleston again if he's available. I did see we are being linked with Marshall from Barnet but fail to see much truth in that as we don't need another right winger.